LightningChart is entirely GPU accelerated and performance optimized charting components for presenting massive amounts of data ‒ more than 1 Billion data points real-time. See the performance comparison with other charting components here. LightningChart includes a wide range of 2D, advanced 3D, Polar, Smith, 3D pies / donuts, Geographic maps & G.I.S. charts for science, engineering, medicine, aerospace, trading, energy and other fields. Along with an outstanding performance, LightningChart offers fully customizable tools and flexibility to the .Net developers within different industries. Our technical support team is known for its ability to handle every challenge from our clients, so you will receive an unlimited dedicated support during your active subscription. Do you need data visualization components for your school work or thesis project? 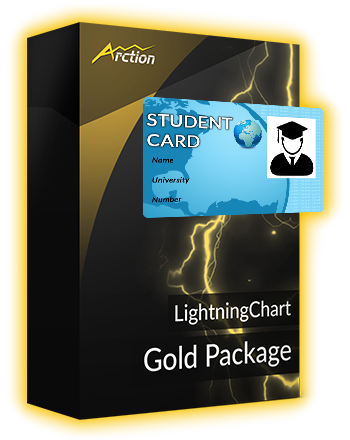 Get LightningChart student license for free! The core breakthrough of the version 8 is a high-performance Volume Rendering extension which can interact with other 3D objects of our library. Volumetric information plays an essential role in medicine, e.g. for an advanced cancer detection, visualization of aneurysms, and treatment planning. It is also used for non-destructive material testing via computer tomography or ultrasound. In addition, huge three-dimensional datasets are produced by geo seismic research, and can also be visualized by our Volume Rendering engine. SignalReader generates real-time data stream reading signal files in different formats: WAV (PCM), sid (biosignal file), ssd (LightningChart Ultimate Demo application sample data format). The playback can be automatically restarted with looping option. Reads real-time sampled data stream from sound card line-in (using e.g. microphone) through DirectSound. The data can be forwarded to chart, AudioOutput or your own data target. SignalGenerator is a multi-functional signal generator component. It allows combining different waveform types into single, real-time output signal. The waveform components can be set with a built-in user interface or by code. Converts data between time domain and frequency domain using Fast Fourier Transform (FFT) algorithm in Digital Signal Processing (DSP). Allows real-time data stream playback via sound card line-out (using e.g. speakers) through DirectSound. The data can be fetched from SignalGenerator, SignalReader, AudioInput or other data source. For WPF, LightningChart component is available in different binding level editions, to balance between different performance and MVVM (Model – View – View-Model) bindability needs. As a general starting point, Arction recommends Semi-bindable API. For best performance in WPF and multithreading benefits, select Non-Bindable chart. OS: 32-bit or 64-bit Windows Vista or later, Windows Server 2008 R2 or later. DirectX: 9.0c (Shader model 3 and higher) or 11.0 compatible graphics adapter. Visual Studio: 2010-2019 for development, not required for deployment. Platform .NET Framework: installed version 4.0 or newer. The fastest and most advanced data visualization components for WPF & Windows Forms.